The spring housing market is here! Every morning lately, my inbox is full of new properties that have come on the market overnight. My first task every day is to review the new listings for all of my buyers who have searches of the MLS system running, and it seems like as the month of April proceeds, I have plenty to look at. When meeting with potential sellers, I'm often asked, "But when is the BEST time for me to get my home on the market?" 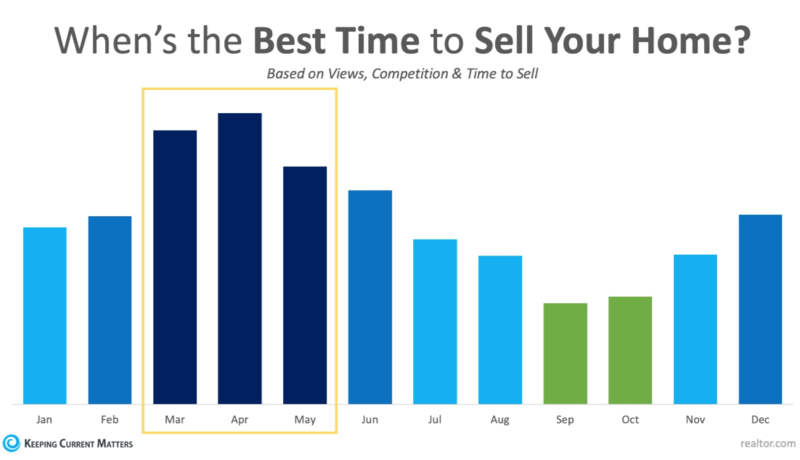 According to new research from Realtor.com, although the whole second quarter is great timing, you can see in the graph above that April is actually the best time to list your home for sale. Competition for homes is fierce in these spring months, as there are many buyers in the market which can lead to getting lots of eyes on a property and result in possible bidding wars. The National Association of Realtors reports that 41% of homes on the market last month were under contract within 30 days. Listing your home in the first week of April contributes 14x more property views, 5% less competition from other home sellers, and results in the home being sold 6 days faster. Don't despair if you have been waiting, however, as inventory remains low in our area and there is still plenty of time to reap the benefits of this seller's market. As the old saying goes, "He (or she) who hesitates is lost," so if you've been thinking about selling your home, give me a call and let's talk about listing your property! Is it time to make a move? Contact me today!